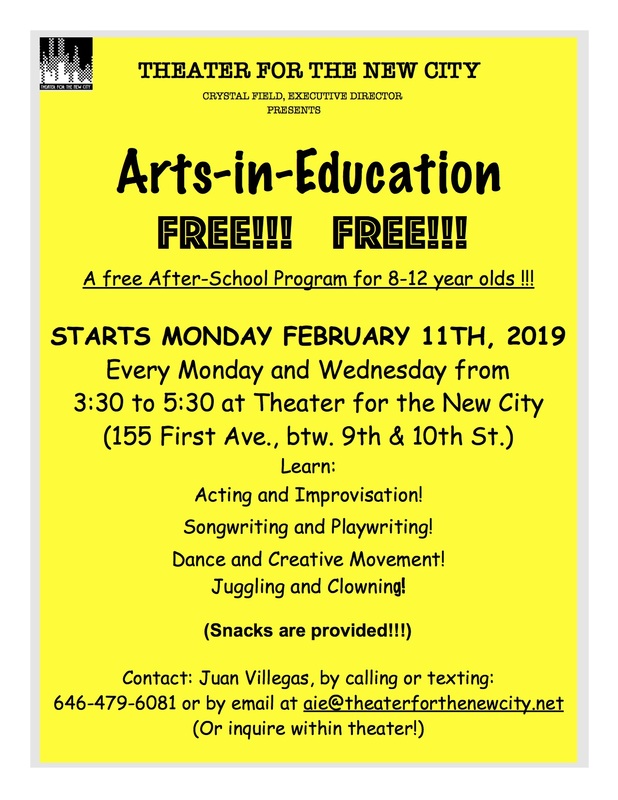 The AFTER-SCHOOL THEATER ARTS PROGRAM is a primary element of Theater for the New City (TNC)’s community programming and its mission to “bring theater into the community and the community into the theater”. The program is offered biannually free of charge and is designed to meet the diverse needs of children and teens with little or no exposure to the arts by providing them with a safe haven to learn and create in a non-traditional setting. LUCKY 20 is Sáenz's Pre-Solo art exhibition and Guest. The art show consists of 12 artists that have exhibited many times before and 5 artist whom this is their first art show. It is a NO theme art show, an eclectic combination of drawings, paintings, and a few sculptures. It's a very colorful and exciting art more for your eyes to see. And Sáenz is exhibiting 4 big paintings from her private collection and 5 small works. Do you want to be seen in the gallery scene? 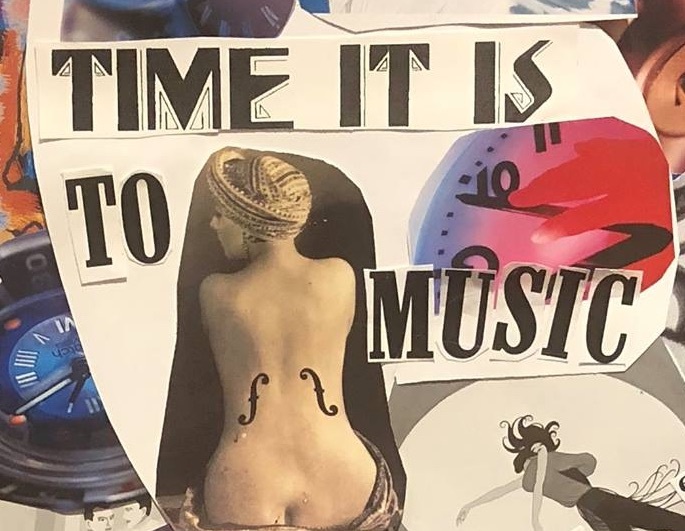 TIME IT IS: TO MUSIC is a new musical based on the award-winning, hit off-off-Broadway play, TIME IT IS, by Lissa Moira. With an intricate, multivariate score and poetic book, TIME IT IS: TO MUSIC challenges the audience to dare to see outside the box of contemporary musical theater—and themselves. WHERE DO ALL THE GHOSTS GO? Where Do All the Ghosts Go? 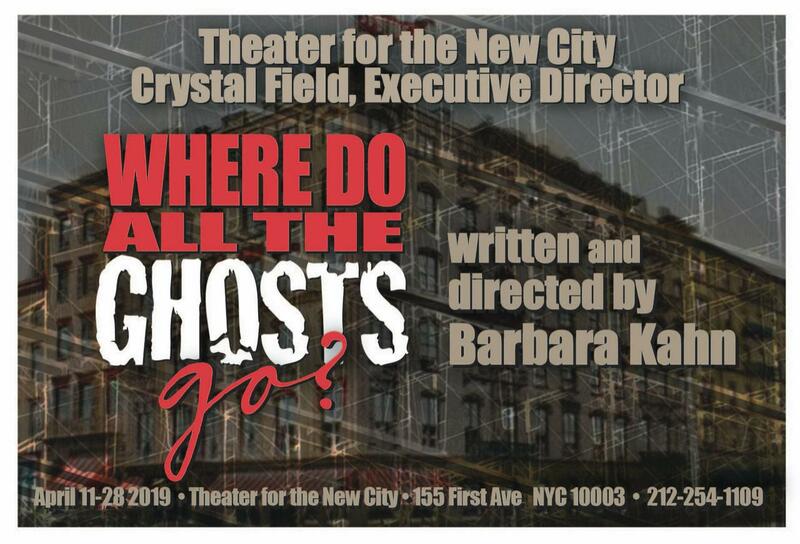 is a dark comedy about the effects of the demolition of a historic NYC building on the ghosts of significant people that have made it their post-life home. brings together five ghosts who faced adversity in life. Sarah Bernhardt, baptized Catholic, faced anti-Semitism in the 19th century for publicly acknowledging her Jewish heritage; Elizabeth Keckley, a former slave and companion of Mary Todd Lincoln, encountered racism and segregation during travels with the widow; Buffalo Bill, Indian fighter in his younger years, employed American Indians in his wild west shows and mourned the death of his great friend Chief Sitting Bull; Marcel Duchamp created a controversial genre of visual art using found objects; Alice Lansen, accused thief, was a self-proclaimed baroness. 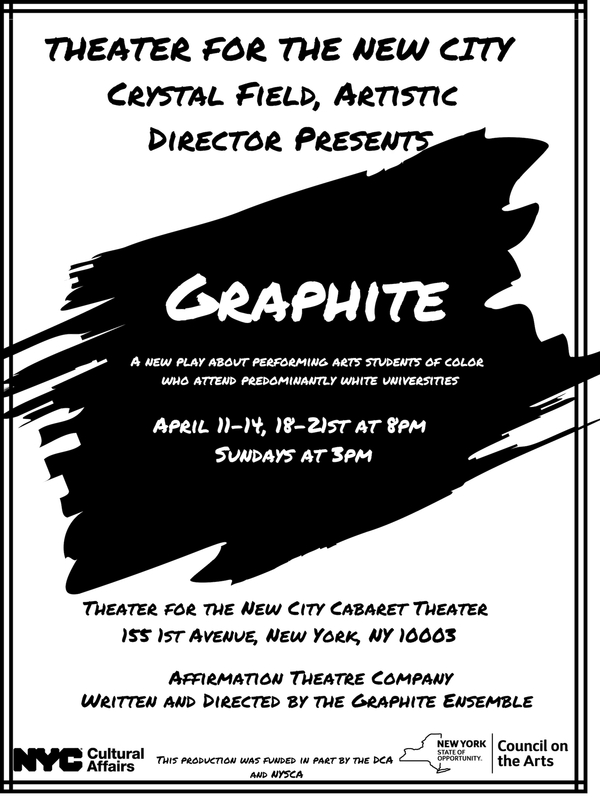 Affirmation Theatre Company returns this April with Graphite, a play about the experiences of students of color who attend performing arts programs in predominantly white universities. Graphite is a powerful and poignant devised piece about what it means to create art in a white space. 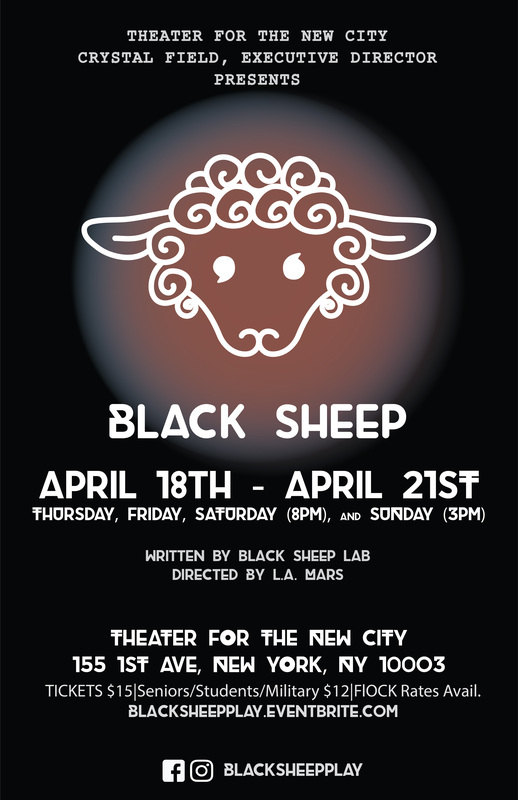 Making its world premiere, the play will run April 11th through April 21st in the Cabaret Theatre at Theatre for the New City. Join The Greenhouse Ensemble as we explore the week’s current events and the world we live in. Think Drunk History meets Improv meets Fake News… We aim to educate not irritate, entertain not aggravate… and of course, we hope to make you laugh. Salzmann’s worldview was completely reversed after his father, a fanatical Nazi, committed suicide in 1945. The traumatic event caused Salzmann to start drinking. It wasn’t until 1976 when he read an interview about an author, who survived the 1933 Nazi book burnings, that pushed him to wander around the flea markets, collecting almost all the surviving works. Thirty years passed, his story was publicized by a journalist, admiring him for his work. While in another corner of the world, an unknown psychological experiment is quietly being unfolded. The experiment that studies the psychi of Salzmann, closely analyzing his language, behavior, and emotions, like Salzmann is there. What are the songs that serve as the soundtrack for your life? The songs that define/resonate with you? What are the songs that you come back to and that sustain you in your times of need/joy/pain/pleasure? 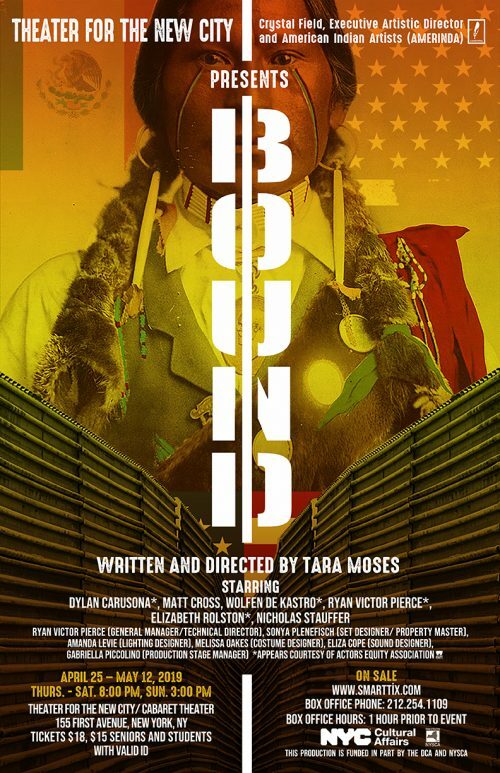 Can a wall at an international border disrupt the intersection of sacred ancestral land and tribal sovereignty as innate rights? What do you get when you combine a corrupt gynecologist, plastic surgery look-a-likes, a lascivious surgeon, a jittery liberal engaged to a staunch conservative, a mysterious man hired for his sexual dexterity and a forgetful Holocaust survivor? You get Knock It Off: A Farce! 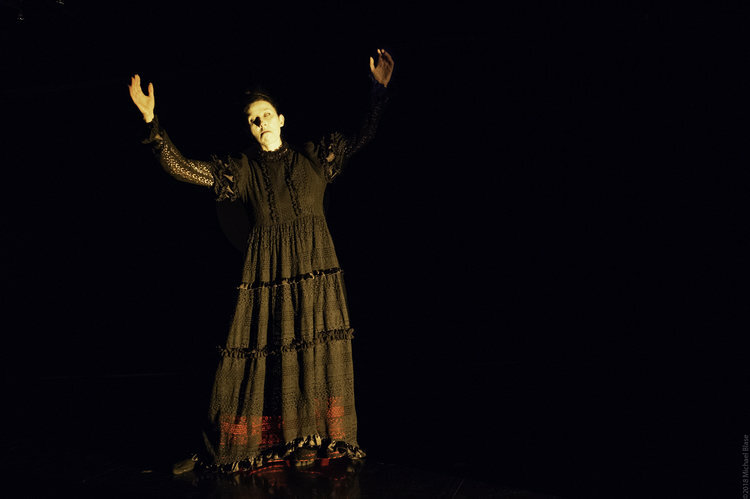 Butoh has often explored techniques of self-erasement, and butoh dancers aim at reaching a form of “emptiness”. For the first time in butoh’s history, this phenomenon will be put to the test: the rehearsal process will be scientifically recorded with the help of MUSE 2, a device capable of recording brain wave activity. 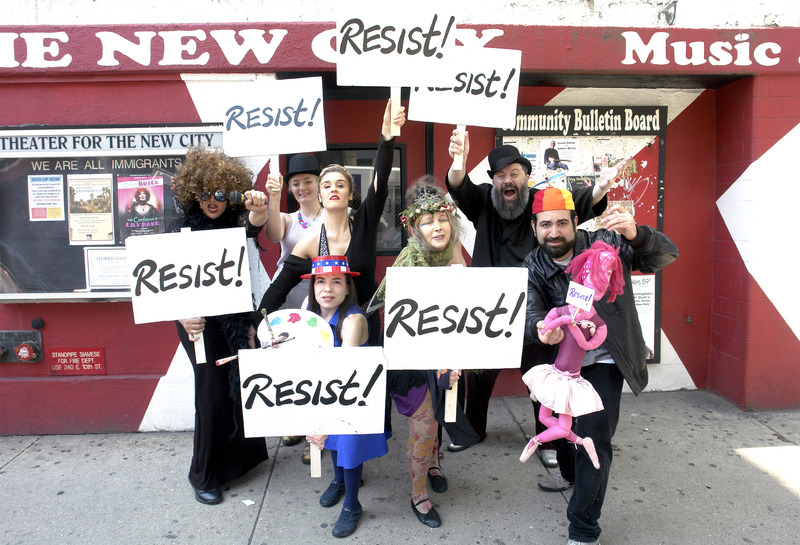 Theater for the New City is presenting its 24th annual Lower East Side Festival of the Arts, a massive annual performance marathon in and around the theater, May 24 - 27. The motto of the festival is "Dream Up: Invent, Concoct." The festival is dedicated to new works. 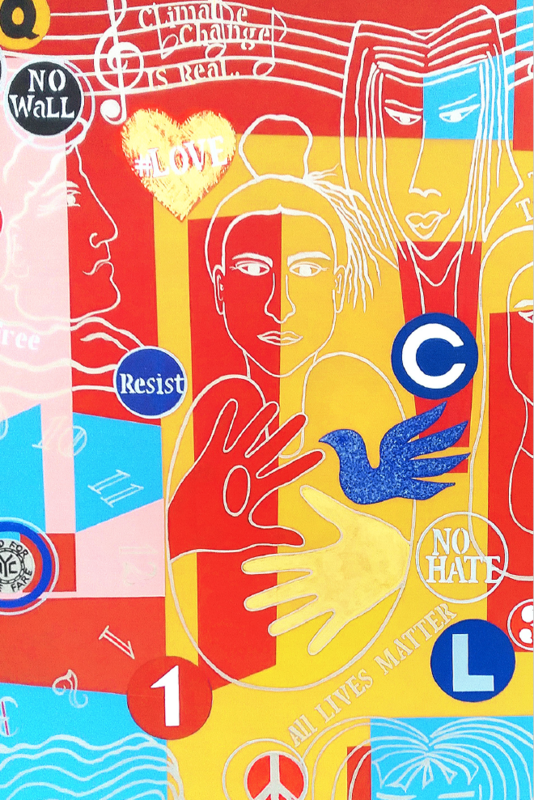 The question of the artist's vision to free or attack the material will be asked in each application. The festival does not want traditional theater which is presented in a traditional way. Theater for the New City wants to use this festival as a way to push ideas to the forefront with the hope of revealing roads less traveled or undiscovered. 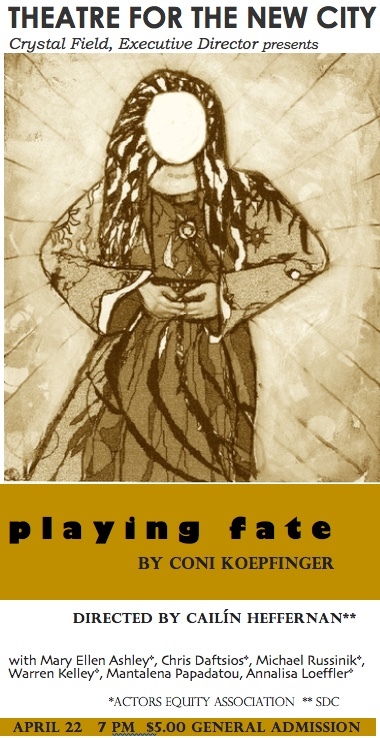 Presentation of a straightforward play must be imaginative in some way. August 25 – September 15, 2019. All performances will take place at Theater for the New City. 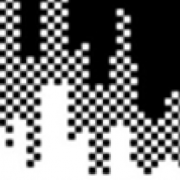 After 20 years, Theater for the New City has remade its website. The original site was made by David Aronson in 1998 and lasted more than anyone ever thought it could. Now David has redesigned and programmed the site using WordPress. Tell us what you think in the comments. THEATER FOR THE NEW CITY (TNC) is a Pulitzer Prize-winning community cultural center that is known for its high artistic standards and widespread community service. One of New York’s most prolific theatrical organizations, TNC produces 30-40 premieres of new American plays per year, at least 10 of which are by emerging and young playwrights. Many influential theater artists of the last quarter century have found TNC’s Resident Theater Program instrumental to their careers, among them Sam Shepard, Moises Kaufman, Richard Foreman, Charles Busch, Maria Irene Fornes, Miguel Piñero, Jean-Claude van Itallie, Vin Diesel, Oscar Nuñez, Laurence Holder, Romulus Linney and Academy Award Winners Tim Robbins and Adrien Brody. 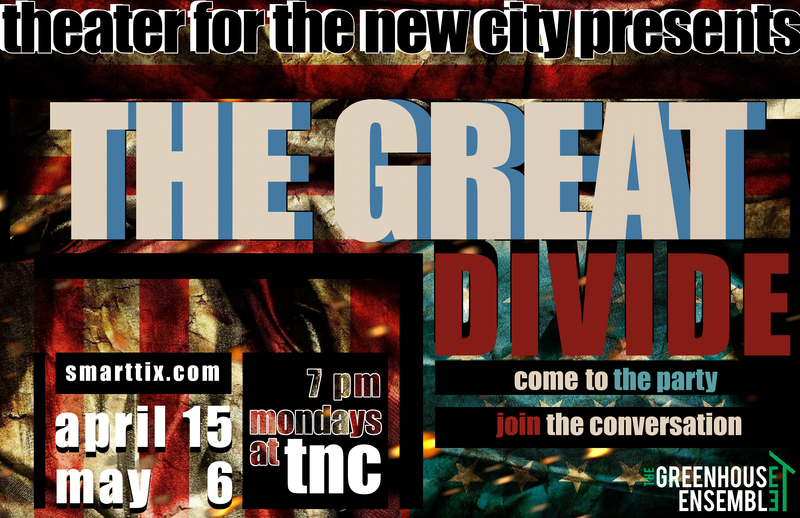 TNC also presents plays by multi-ethnic/multi-disciplinary theater companies who have no permanent home. Among the well-known companies that have been presented by TNC are Mabou Mines, the Living Theater, Bread and Puppet Theater, the San Francisco Mime Troupe and COBU, the Japanese women’s drumming, and dance group.TNC also produced the Yangtze Repertory Company’s 1997 production of BETWEEN LIFE AND DEATH, which was the only play ever produced in America by Gao Xingjian before he won the 2000 Nobel Prize for Literature. TNC seeks to develop theater audiences and inspire future theater artists from the often-overlooked low-income minority communities of New York City by producing minority writers from around the world and by bringing the community into theater and theater into the community through its many free Festivals. TNC productions have won the Pulitzer Prize for Drama and over 42 OBIE Awards for excellence in every theatrical discipline. TNC is also the only Theatrical Organization to have won the Mayor’s Stop The Violence award. ALL PROGRAMS SUBJECT TO CHANGE. RESERVATIONS HELD ONLY UNTIL TEN MINUTES TO CURTAIN. PLEASE ARRIVE AT LEAST TEN MINUTES EARLY. Theater for the New City gives special thanks to the Christopher & Dana Reeve Foundation for its Quality of Life Grant in support of our on going effort to obtain a Handi-lift Elevator. Folks WE ARE 75% of the way there and the Reeve Foundation has been a beautiful and important part of our struggle to be totally accessible to all of our audience. They have helped greatly in the match for the grant from the New York State Council on the Arts (NYSCA). We will shortly be announcing the names of other donors for this important project. A project that gives disabled and frail elderly patrons and artists accessibility to our lower level theater and to a large part of our production facilities.